My poem ‘Jackdaws’ is part of a larger sequence I am writing based around the Dartry Mountains in Ireland. The poem was shortlised for the Fish Poetry Prize 2016, run by Fish Publishing who operate from Bantry in Cork. Well done to the winners. 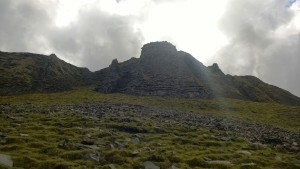 The Dartry Mountains includes Benbulben in Sligo (Yeats’s mountain) and travel north to Arroo, overlooking Lough Melvin, a lough that is part in the Republic and part in the UK. It is an area full of natural beauty, geological wonder, political and social history and, for me, family history, with my mother being born in Glenade. I’m off to Ireland again this month to spend more time among the hills and to write, write, write. I’ll do what Liz Lochhead suggests: tie myself to a chair and tie the chair to the desk. There might be time for a night or two out in Bundoran for a pint or two of the black stuff in Brennan’s Bar or a bite to eat at Madden’s Bridge Bar. That and a hallo to my family there. So, with all that, my Irish poems will be more and more formed. Perhaps I’ll have others for the Fish Poetry Prize next year. Nice one Charlie. Good luck.